The Model 132C incorporates versatility, rapid setup and accuracy into a rugged and affordable machine. It has a .080" (2 mm) to 1.25" (32 mm) diameter capacity and it can grind tools with 1, 2, 3, 4, 5, 6, 7, 8, or 10 flutes. Our unique design features point splitting and web thinning capability and it allows quick grinding of almost any HSS or carbide drill point. The proper geometry for the application can maximize drilling performance to provide the lowest cost per hole. Stepdrills, taps, reamers, countersinks and endmill ends are easily ground with minimal setup changes. In addition, the standard workhead can be exchanged in less than one minute with the optional air-bearing attachment for grinding endmill ODs. 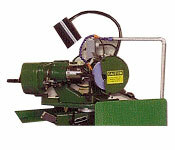 The power-driven workhead of the semi-automatic version offers a quiet, smooth rotation of the workhead. Manual effort is reduced for heavier grinding and spin grinding operations. Sparkout is allowed to occur by using a minimum of manual infeed along with a reduction in workhead rotation. The speed is controlled by a conveniently located valve; the adjacent four-way valve allows grinding in either direction. A hand knob on the workhead is used for indexing and setup. Timesaving option allows truing of the grinding wheel O.D. without changing the setup. Capacity: .080" to 1.25" (2 to 32 mm) diameter straight shank or taper shank. Drill Point Angles: 40 to 180+ degrees. Motor: TEFC 1/2 HP 115/230V. single-phase (standard) TEFC 1 HP 230/460V. three-phase (optional). Weight: Benchtop machine: 240 lb. (110 kg) net, 330 lb. (150 kg) cratedWith cabinet: 350 lb (160 kg) net, 460 lb. (210 kg) crated.